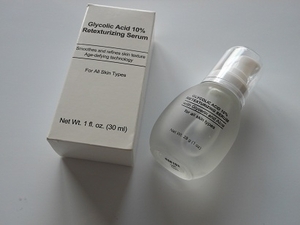 The serum when used regularly at night smoothes and refines skin texture. Glycerin and Aloe keep skin from getting irritated. Alpha Hydroxy and glycolic work to exfoliate outer layer of environmentally damaged skin leaving it smooth and radiant. Diminishes the appearance of fine lines and wrinkles.